Something happened while I was reviewing this game, that has never happened to me before. As I was leaving a group, another player urged me to support Shadowrun Chronicles: Boston Lockdown, and that there was no game like it. He spent a few minutes, not quite pleading, but seemingly wanting me to have a good impression of this game. This was important given our previous experience. We had just beaten a difficult section despite dying horribly, due to a collection of flamethrower-toting gang-members encircling us, which consisted of myself and another player and two NPCs (of which we each controlled one. Coordination became an issue, as we could both act simultaneously – but when our characters actually moved, the other player’s movement indicators would reset, leading to them having to repeat it again. Never mind how hard it had been to get a group before, nor how many issues had cropped up with players forcing to restart due to the host leaving the group and the other members being unable to leave. 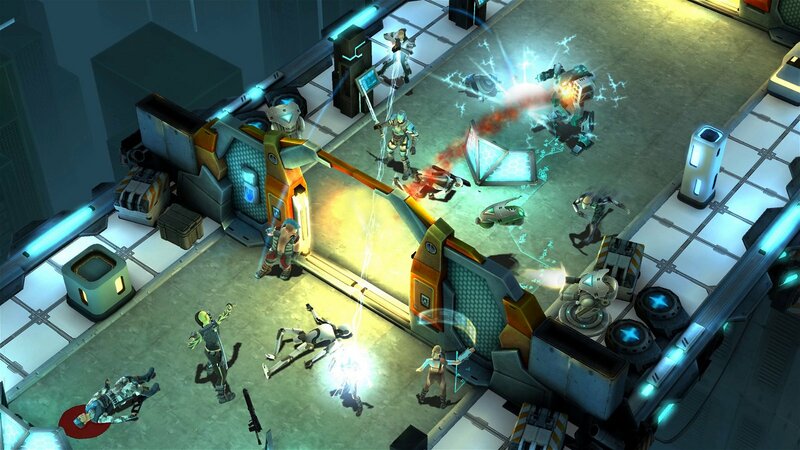 I don’t want to compare this game to Harebrained Schemes’ Shadowrun Returns – the two were in development at the same time, they share a turn-based system, and they’re both set in the same universe. It’s unfair to strongly compare the two games, especially since Chronicles is more of an MMO – or at least a hub-based online game. In truth, I feel for Shadowrun fans who want to support the MMO, speaking in the game’s general chat with the distinct Shadowrun lingo (“Hoi Chummers” and all that). The game itself, sadly, suffers heavily from its flaws and from being a bare-bones experience. The plot is fairly basic; you operate as a Shadowrunner, a mercenary hired to deal with the supernatural and cyberpunk world that is Boston. You take jobs, in the form of turn-based “runs”, as the city is overwhelmed by a sudden strange outbreak and rising gang violence. It’s sufficient for the game’s purposes. Creating your Shadowrunner is fairly fun, and has a decent degree of customization that I found welcome. Appearance is entirely modifiable, and you’re presented with dozens of options, ranging from military gear to Matrix-style jackets, beards and tattoos, and skimpy fanservice miniskirts (none of which are gender-locked). Your skills are purchased through “karma” gained by completing missions, and by turning in the jobs back at the hub (the latter of which can only be done once per mission, requiring long farming if you want to max out your XP trees). This gives you an incentive to help out on any mission you aren’t currently doing with other people, giving you some more points to level yourself up. 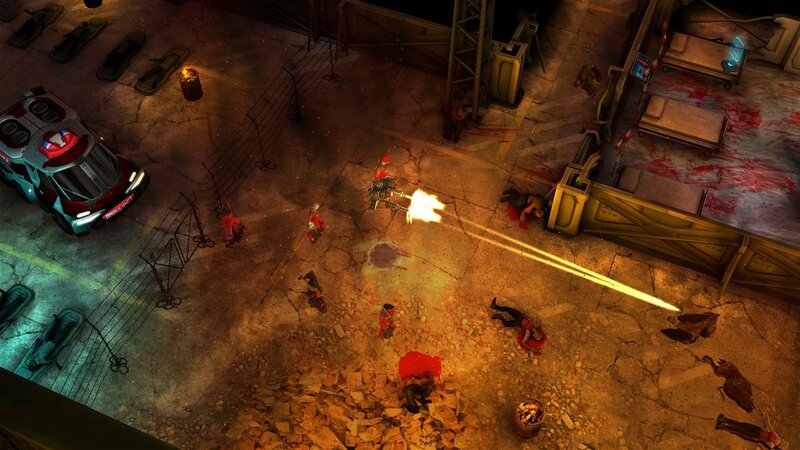 Each Boston Lockdown mission is a fairly-small turn-based map, depicting areas from crate-laden docks to corporate towers, to the ever-convenient sewers of science fiction and fantasy. 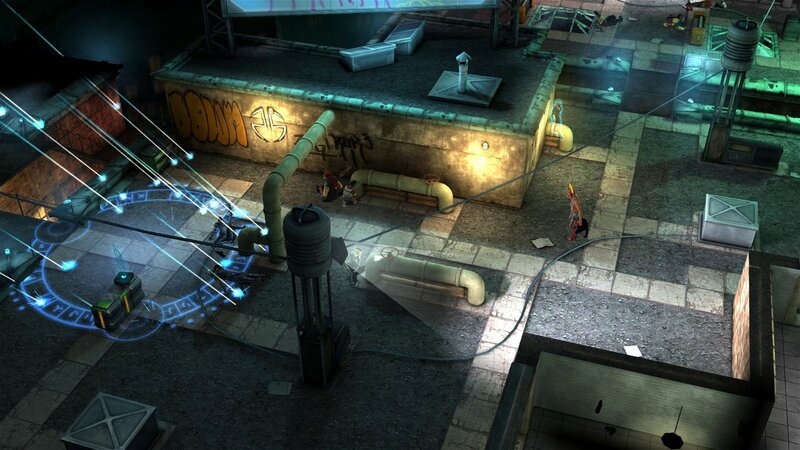 These levels look pretty good, capturing the run-down, hyper-modern future. Sadly, you’ll see a lot of the same maps, as the game frequently reuses entire layouts for different missions. It’s not egregious, but it is does break immersion. Fortunately, the maps are well-designed – glass shatters and cars explode with triggered alarms in fire-fights, and there are several containers or doors affected by skills such as lock picking or hacking that can provide more items or give advantages in missions. It’s fairly simple to have bare proficiency at two of these environmental skills, so you’ll rarely have an issue where it’s impossible to do. I admit, I played through the game with pure magic, using Summoning and Spellcasting, thus making myself entirely reliant on mana all the time, except for my summoned bear-spirits. The issue with this is that there are several damage types, such as physical, magical, or “tech” (hacking), and certain enemies are differently affected. For example, robots are unaffected by any magical damage, meaning my bearded elven streetmage had to hide behind a spectral grizzly bear if his party were unavailable. The combat itself is a bit of a gamble, mostly due to how deadly it can be if you make a mistake. 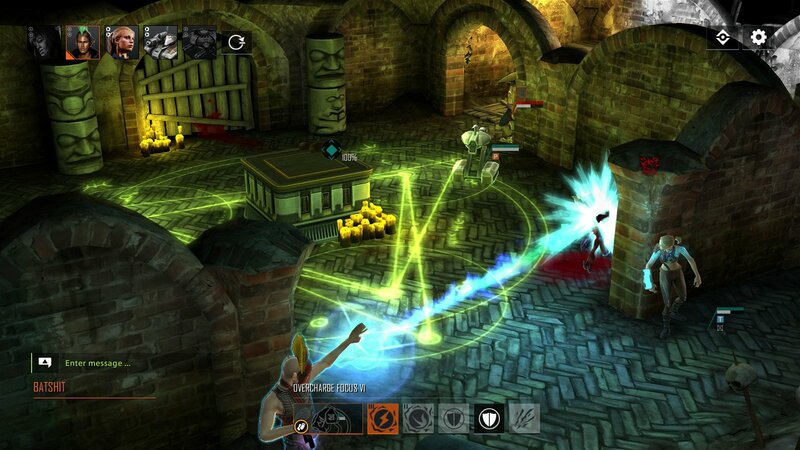 Some enemies go down quickly, but others have mountains of hit points and armour, particularly flamethrower-enemies who can easily kill you in one attack. Cover is completely critical, but even that can’t entirely mitigate damage – healing is almost entirely through items you carry that have limited uses, and a few key skills. Death puts you out for the entire mission, and gives players a limited time before they’re booted and the mission is failed. There’s no consequence for that besides having to restart, and you keep any items you found anyway. However, it does mean you have to do the same missions again, and this can get tedious. Of course, doing it as a group is far easier, and generally doesn’t result in horrid death. A properly coordinated group is key – making that group, however, has several issues. Firstly, the interface lacks support for basic commands, like /invite or even a whisper function, leaving only a general chat and a hub chat (the latter based on your current hub) as areas to ask for missions. While you can join any mission, and there’s some leeway in what level of power you’re at, I found it nearly impossible to get help for the specific missions I needed to progress the main game. 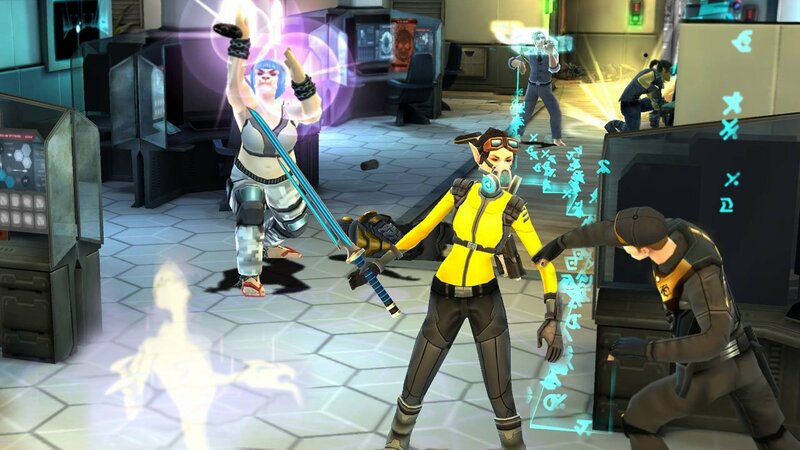 There’s a lot of basic functions that we take for granted in MMOs that just…aren’t there. It makes a lot of grouping and communication difficult, which in turn eliminates the point of having a multi-player element. In the end, the missions just aren’t enough to really make this stand out too strongly. They’re adding more to the game and apparently working on expanding its interface, so we’ll see how it goes. Right now, it’s a bit lacking for a forty-dollar price tag, and I recommend that players keep an eye on it to see if they expand on much-needed functionality. In truth, I feel for Shadowrun fans who want to support the MMO, speaking in the game's general chat with the distinct Shadowrun lingo.